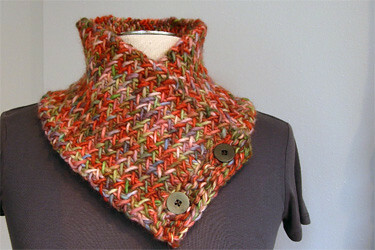 The Herringbone Neck Warmer has all the makings of a fantastic last minute holiday knit. It uses 1 hank of Sheep Shop One yarn, which comes in great colors for women and men; it’s a worsted weight yarn knit on size 11 needles, so it moves along quickly; and, it’s a cool stitch pattern that’s fun to knit. Repeat rows 1 and 2 to desired length. UPDATED, 8/4/2011: Because the stitch pattern can be confusing, I made this short video. Check it out! Work Stitch Pattern for 28 inches, ending with Row 2. Bind off all stitches. With yarn doubled, pick up and knit 15 stitches along bound off edge. Knit 1 row. Buttonhole row – K3, yarn over, k2tog, k5, k2tog, yarn over, k3. Knit 1 row. Bind off. Sew buttons on beginning side of scarf corresponding to buttonholes. Weave in ends. I knit this over a 4 day period while working on other projects. It probably would’ve been finished in 2 days if I’d worked on nothing else. Enjoy! Fantastic! Has anyone made one in a solid color? I’m curious as to how the stitch looks in one color. Thanks, Jo! I’m glad you like the neck warmer. We haven’t knit one in a solid color yet, Sharon. I imagine it will look great because the stitch pattern is so bold. Which stitch are you knitting through the back loop when you psso but knit through back loop first ? You’re knitting through the back loop of the stitch you’re passing over. It worked well for me to put it back on the left needle and then knit through the back. That is what I thought, but I just wanted to be sure. I think I will enjoy knitting this. Thanks for the pattern. I’m working on this pattern now and i dont know if i’m wrong but does row 2 end with a purl stitch? i swear i didn’t miscount because there row 1 stitches out perfectly… maybe i’m doing it wrong? Yes, row 2 ends with a purl stitch. You purl 2 together then purl the first stitch a second time, just like you’ve been doing across the whole row. If you’re working across the row and end with a single stitch on your left needle, then something has gone wrong. You’re stitch count shouldn’t change from row to row. Thanks so much!! my pattern doesn’t look as clean as the one above… does this look right? something about it still makes me think i’m doing it wrong…. Could someone elaborate on Row 2 a bit? I know it shouldn’t seem this difficult but I’m having trouble visualizing purling the 1st stitch again. I feel like my pattern looks odd. For row 2, you’ll purl two stitches together and leave them on your left needle. Then purl the first stitch on the left needle again; then slip both stitches from the left needle. The first step, purling two stitches together, is a decrease, so you need to purl that first stitch by itself to create a second stitch and keep your total stitch count the same. Thanks so much Craig! I may stop by the store today just for some reassurance. I’m looking forward to giving this as a gift to my brother’s girlfriend! Thanks so much for such a beautiful pattern! 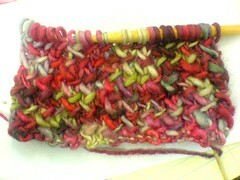 I started it this morning and after 4 false starts am getting the hang of the pattern and it’s looking great. Thanks again. I am also having problems with this pattern–sorry I know it’s essentially only two lines, but I appear to be too much of a dunce to figure them out! I get that in line two you purl two together, and then move that stitch back onto the left needle and purl it again. Then you say “drop both stitches off the needle”– as far as I can tell that’s still only one stitch, and by “drop it off the needle” do you actually mean just move it back to the right needle (not actually drop it off)? sorry! I hope I’m not just over thinking everything —I love the way this pattern looks and am itching to give it a go, but after starting over several times I figured I’d come nag you about it! There actually are increases on both rows. On row one you have the passed over stitch (decrease), but you knit it through the back loop first, which is an increase. On row two, you purl 2 stitches together (decrease) – and keep the 2 stitches on the left needle – then you purl the first stitch on the left needle again (increase) before dropping both on the needle. You don’t move the first purl stitch back to the left needle. I just bought the yarn for this while in your shop this afternoon, and I’ve already finished it! Nice little project for auto-knitting. I’m going to wear it tomorrow. Thanks. I always want to use hand-dyed or print yarns, but sometimes it overwhelms a sweater. This couldn’t be prettier. Hi there, I realize this page is old, but I stumbled across it and LOVE the look of this! I think I have figured out the majority of the pattern, but the part that has me (a beginner!) confused is the button hole part. When you say “with yarn doubled, pick up and knit 15 stitches” – what does that mean? Specifically the yarn doubled bit. Any help would be appreciated – I would love to make this neckwarmer! “yarn doubled” means that you are knitting with 2 strands of the yarn. If you’ve wound your yarn into a center-pull ball, hold both ends together and begin knitting. You can also wind some of your yarn into a second ball and knit from both at once. Hope that helps! It’s been a while since I’ve knit this, so I don’t remember what the bound off edge looks like. But yes, you want to pick up the 15 stitches evenly across the piece. Can you recommend an average “desired length”? I am making this as a gift for my brother so I can’t really try it out on him first. Thanks! Please ignore my previous question. I just re-read the pattern and realize you did specify 28 inches! Please explain again Row 1 of Herringbone neck warmer. I knit one, sl l, psso but knit in the back first. Do I put the slipped stitch back on the left needle, knit in the back, put it on the right needle, and drop the slipped stitch on the right needle to slip back over the knitted stitch, knit and then what???? I am not sure I am doing it right tho come out with the right amount of stitches. It is a neat neck warmer and the second row seemed easy enough. Love this design!…and thenks for the pattern! Which colorway is pictured above with pattern? Thank you for finding that tutorial. That was great help. It makes everything clear. It is so appreciated as this is a nice neck warmer. Love the look of this. Will be knitting this to match fingerless gloves and giving the set a Christmas gifts this year. Thank you! Is it possible for you to do a video or photos of the stitch progression as without seeing it the directions seem to not make complete sense. I have looked all over and have found some herringbone stitch tutorials, but, this stitch is different…I love it and REALLY want to do this scarf, but, remain at a loss as to how to visualize this pattern’s stitches. I am trying this pattern and cannot get it! You cast on 30 sts. After row 1 how many sts should there be? After row 2 how many sts should there be? I’ve attempted this pattern about 4 times. Don’t know what I’m doing wrong. I got it! Thanks to one of my co-workers. Oh good, I’m glad you got it! It is confusing until someone shows you.